This pattern is available here. I have to say that this pattern is the BEST pattern i have ever worked with, it comes with very concise instructions along with alot of quality tips. It contains alot of different ways you can adjust the pattern to create a variety of looks. It is kind of like a pattern/sewing class in one. I have learnt alot from it and highly recommend it. 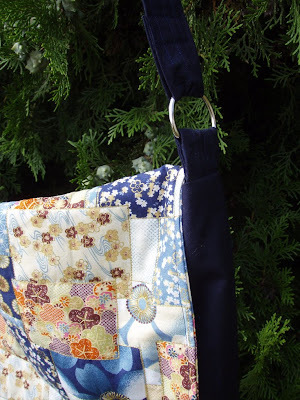 Her range of patterns can be completed from Beginner to Advanced and as you work through them all you learn a variety of bag making techniques. 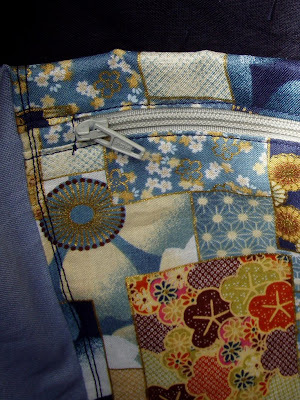 I used a navy cotton medium weight fabric, and a lightweight Japanese style fabric for the flap both bought at Lincraft. 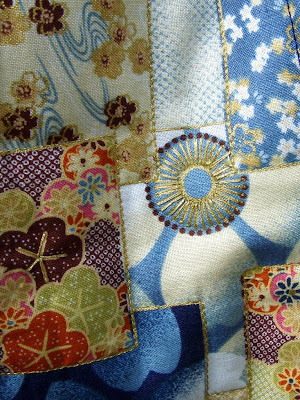 I have sewn over the pattern on the Japanese fabric with gold thread to create a quilted effect as well as embroidering over some sections of it. It is the first time i have used D-Rings to make an adjustable strap and i am particularly proud of my zipper pocket inside - i think it looks very professional! The only things i could have made differently is used some interfacing on the outside of the bad, it's a bit floppy and maybe some in the shoulder strap too. I am definitely planning to do some more of Nicoles patterns so i can improve on my skills some more. I am also nearly finished another pattern.. I do find Amy Butler patterns not the most clearly written patterns but if you have half a brain on your, you can generally work out whaat they are trying to say. I have sewn everything except the hems, so stay tuned for some photos. I have used the same fabrics that are in my bag but i am not intending to wear them together as that may just be a bit of overkill! I love Nicole's stuff, I stop by her blog every day! No patterns bought yet as I am poor, but someday!! I love the bag - its looks great. That was clever to stitch in gold over the fabric. When I first saw it I did think you'd quilted the flap, so the illusion worked! I really like Nikki's patterns too. The instructions are the best I have seen. I think you did a supurb job on the bag, Katy - you should be proud and excited. Can I link to your post from my web-site? 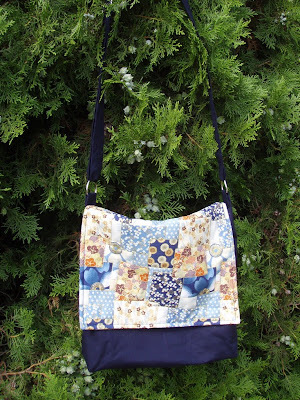 the bag looks great - I also thought you were a quilting master! your added stitching gives a great effect. I look forward to seeing your finished skirts too. Love the bag (looks most professional)- the fabrics you are used are perfect! Great bag - love the colour combos! A crafty lady living in Queensland. I love to sew, design, print, stamp, embroidered and generally MAKE THINGS!